Ever wonder why sometimes you have a hard time focusing? Or why some days you don't perform as well as other days? Many times a contributing factor is stress and negative brain chatter. Yoga, pranayama and meditation are tools to keep in touch with your inner stress level and develop positive thoughts and emotions. Lawyer Yoga is an introductory class specifically designed for busy lawyers. Take a first step to change negative thought processes that create anxiety and inhibit performance. Learn how to focus under pressure. This course provides lawyers with actionable strategies that fit into your busy schedule. Beginning techniques designed by lawyers for lawyers. The focus of Lifestyle Lawyer is to encourage lawyers to think about how technology is changing the legal landscape and how this actually might play to their advantage. How can a lawyer have a successful career and a life outside of the office? What is it that you love and how can you make the things you love a part of your daily life? 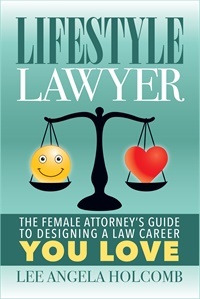 My hope is this book will help women lawyers find a voice, find a position within the new legal market, and find the courage and knowledge to use their law degree and stay in the practice of law. This product includes the eBook Lifestyle Lawyer by the author as well as an hour long CLE program.